Recently, I got to decorate for Palm Sunday and so I started to think through some fun installations that I would want to see come to life. One of them, which I will share later, looks even better than I initially imaged it would but one of them had to get cut due to lack of time. So last minute I came up with this fun, cheap and super quick idea. We had already ordered the supplies in anticipation of potentially running out of time so that made it easier to switch. I had an existing white wall that I attached them to but you can attach these to any wall or even a backdrop fabric or paper if you have a pop up frame to put it on. My backdrop is 8' x 8'. I personally think all backdrops should be at least 8' x 6' wide but preferably 8' x 8' unless you have photo booth or photographer taking the photos. There is nothing worse than taking a picture and seeing the edges of a backdrop because it is too small. Purchase your palm leaf backdrop kit here. This will include everything you need. Decide whether or not to use hot glue. I used hot glue because I was not worried about damaging the wall/paint. If you are putting this on a structure that you do not want to damage, DO NOT USE HOT GLUE. Go with the double sided tape. 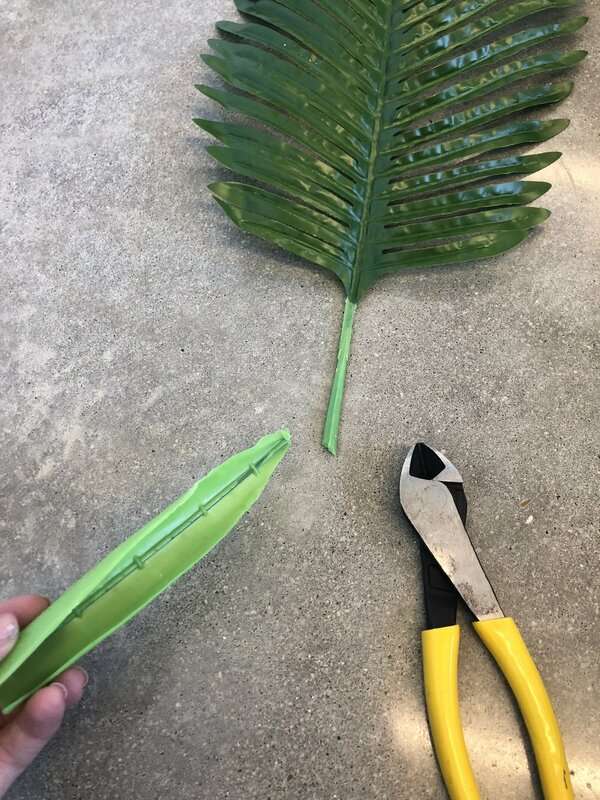 Monstera Palm Leaf (below) - If you are using hot glue, turn the leaf on its back and place glue on the top and at the bottom of the leaf on the stem, two spots should be enough. If you are using double sided tape, place the tape only on 3-4 leaves, it doesn't stick well to the stem. I placed my first monstera leaf 2 inches from the top and 2 inches from the left side. Continue down, leaving 2 1/2 inches in between each piece. I just eyeballed it to keep the lines straight but if you do not trust your eyes, use a level to be sure you are creating a straight line with the leaves. Depending on the size of your wall, you should be able to fit 5 monstera leaves in one line. Palm Leaf (below) - When you get your palm leaves, they will likely have an extra long and thick stem, you will want to cut off the bottom portion (see below). They should easily come off with a good pair of wire cutters. Cut them at an angle so they look more natural and leave as much of the stem as possible. Make sure that the stems are straight, it will help make the design look more professional if you pay attention to the details. If you are using hot glue, place glue at the top and middle of stem. Do not put glue on the leaves, they will melt and you want them to old their shape so it will create dimension on the wall. I placed my first palm leaf 5 inches from the top and 5 inches from the right side of the monstera leaf, so it was in the middle of the top two monstera leaves. Continue down leaving about 2 1/2 inches in between each piece. Use a level to make sure you are keeping a straight line unless you feel comfortable winging it. You should be able to fit 4 palm leaves in one line. If you were using this for one day and wanted to make it extra special, I would go to your local florist or market and pick up some real leaves to use instead. You will just need to adjust spacing and amount since they will likely be different sizes. Also, double sided tape or hot glue will work on real leaves as well. Here is a previous backdrop I did for Three Twelve Co. using real leaves that I taped (double-sided) to fabric that was draped over a wood wall. Thanks for reading along! If you end up trying this, let me know how it went and tag me on your posts so I can see the finished product! Let me know if you have any questions! Happy creating!